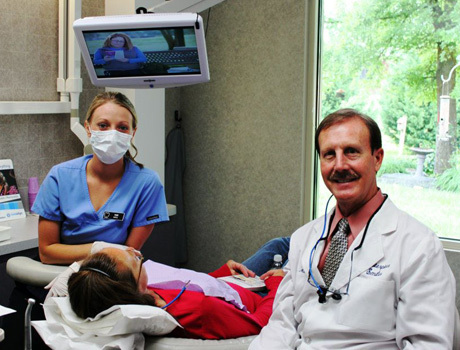 The first time you meet Dr Michael B Beeler in person, he will become your favorite dentist. I was born in Spartanburg, South Carolina, lived in Oneida, TN, and Bloomington, IN, but I “grew up” in west Tennessee. I graduated high school in 1968 from Martin High School. I earned an athletic scholarship to play football at UT Martin and earned a Bachelor of Science degree. I was accepted to dental school at the University Of Tennessee Center Of Health Sciences in Memphis and graduated with a Doctor of Dental Surgery degree in 1975. I am close to my two younger sisters, Susie and Janet. One sister became a nurse, married a veterinarian, and she and her husband, Dr. Danny Walker raised their family in Jackson, TN and now live in Martin, TN. My other sister became a dental hygienist, married a children’s dentist, and she and her husband, Dr. Rocky Turner raised their family and continue to live in Spartanburg, SC. Both my mother Harriett, and father Jack, grew up in Knoxville, Tennessee and went to Central High School and to the University of Tennessee at Knoxville. My father was a great high school and college football player. He played tailback for General Neyland, played as a freshman and sophomore, and lettered in 1947 and 1948. It’s always fun to show my buddies his photo on the ’47 and ’48 team pictures. He married my mother without Coach Neyland’s permission and as a result Coach Neyland cut his scholarship but didn’t kick him off the team. He wanted to see if marriage softened him and he wanted to see if he was tough enough to earn back his scholarship. My father didn’t think that was fair so he transferred to Wofford College in Spartanburg, and after “sitting out” for one year he started at quarterback/tailback on the 1950 and 1951 teams. He was selected first team tailback/quarterback Little All American in 1951. He played in the post season Blue/Gray game and then played for the Chicago Bears for one year before being injured. He was later inducted into the Wofford Hall of Fame and selected to their All Time Football Team. In 2013 he was elected into the UT Martin Hall of Fame (posthumously) as a football coach. My mother got her master’s degree at Indiana University and became a high school English teacher, and my father became a college football coach. Their parents, my grandparents, lived in Knoxville so we would always come to Knoxville to visit for several weeks during the summer. We never lived in Knoxville while I was growing up, but the hills of East Tennessee were in my blood and settling here just felt right. Family and “old fashion” family values have always been important to me, and I am close to all of my nieces, nephews, “in-laws”, and extended family members. Believe it or not, all of our families get along well, and we always have fun when we get together. Spending time with my family members is the most important activity in my life. We are blessed that none of our family members have been involved with drugs or drug addiction. We are all healthy, hard working, law abiding citizens, high achievers, and patriotic, but not too political. My wife, Angela, and I have been “soul mates” for 28 years and she has had the patience to allow me to follow my professional dream of building my own dental facility, becoming the best dentist that I can be, and owning and managing a profitable dental business. She is the accountant for our household finances, she assists me with some of the business side of dentistry, and is a full time mom to our youngest daughter, Chloe. I am very close to, and proud of, my three children, Jeff, Tori, and Chloe. Both Jeff and Tori attended and graduated from Bearden High School and the University of Tennessee at Knoxville. Jeff is married to a wonderful young lady from Spartanburg, SC. He is a medical sales rep, and his wife is an architect. They live in Nashville, TN. Tori is married to a fine man from Knoxville (a two time Iraqi Army Reserve veteran, by the way) and they have two children, Reece (8) and Hayden (6). So, I am a Grandpa! Tori works for an international company located in Clinton, TN. She is also an announcer for the SEC network and the Lady Vol soccer home games. Her husband is a general contractor and project manager for a large construction firm in Knoxville. Both Jeff and Tori were good students, popular, and active in sports in high school. Tori was captain of her high school soccer team, played on the state “ODP” team, played on the Nashville Lady Sting club soccer team, and earned a scholarship to play soccer for the UT Lady Vols, where she played defender for four years. Jeff played high school football and soccer, and worked all through college at Clayton Homes and had a good time with his buddies and the girls! I love and am proud of them both….they graduated from college, got married, are gainfully employed, and they are happy! Angela and I still have the blessing of having our Chloe at home. She is 17, and attends Anderson County High School. She played for three seasons on the girls soccer team, but decided to get a job and work for some extra money her senior year. Chloe was on the golf team at Norris Middle School. She and I enjoy playing at the “Wee Course” in Knoxville every now and then. Chloe was becoming a good pianist, playing some classical pieces, but she decided that ten years of piano lessons were enough. Now Angela or I are the only ones who play the piano for pleasure. This past year Chloe and Angela began taking archery lessons and both seem to be naturally very good. Chloe is more focused now on her school work and her senior year in high school. She is really becoming a good chess player in my weekly matches with her. Angela and I enjoy working around the house, visiting family, going to a movie and having a “proper date” at least once a month. We rarely missed a UT home football game for over thirty years and we still never miss either watching UT games on TV or listening on the radio. We are UT fans for both the men’s teams and the “Lady Vols”! We attend some home UT football games and go to a concert every now and then. Living in Norris, Tennessee has been like living in “Mayberry” on the Andy Griffith TV show. Being part of the Norris community for over thirty (30) years has been like going back in time to a safer and more innocent place. You really should look up the history of our little town on the internet if you have time. The construction of Norris Dam and the birth of our little town is unique. My personal hobbies are photography, playing the piano, keyboard, or guitar, song writing, playing a little golf, shooting guns, and learning and researching new developments in dentistry. Technology, new gadgets, reading and learning something new about nature, our planet, and our universe are all interesting to me. Obtaining knowledge, learning, and having a better understanding about people, cultures, and places on our planet are fascinating to me. Reading books or listening to CD’s, discovering and improving new ways of doing things, self improvement and personal growth help me know and understand myself better. Mentoring, helping others feel better about themselves, and helping them to have the self confidence to be more successful in their life, gives me purpose, and fits in well with my mission in dentistry. Having a better understanding of people, human behavior, and the common needs, wants, and values that most of us share, has helped me become a better dentist. Someday I believe that I will become more of a “life coach” and mentor to other dentists and dental professionals by starting a dental consulting business. Developing good communication and listening skills are at the core of any successful business in which personal relationships and trust are involved. Dentistry is very personal and can be, for some people, very stressful. I really encourage all of my staff to improve their communication and listening skills in order to “connect” with patients. It is hard to fake compassion, patience, competence, understanding, and genuine concern for another human being. My hope is that your dental experience at Masterpiece Smiles with me and my staff is the best that you have ever had. Any business whose services can exceed a client’s expectations will succeed if the client/ patient is appreciative enough to pay for that level of service…in order for the business to stay in business. Cash flow is the life blood of any business. Thoroughness and extra attention to detail never go out of style. Beautiful smiles don’t happen by accident…and they don’t stay that way by accident. Beautiful smiles and healthy mouths require an investment of time and money. It’s a commitment by both the dentist and the patient. In the long run everyone is a winner. It is my hope that if you choose me as your personal dentist, I will promise to always treat you with the same respect and dignity that I would my own family members. I will always give you my very best. I hope that I will have the opportunity to meet you and show you why my office and my team are unique. It is my intention and desire that we exceed your expectations!